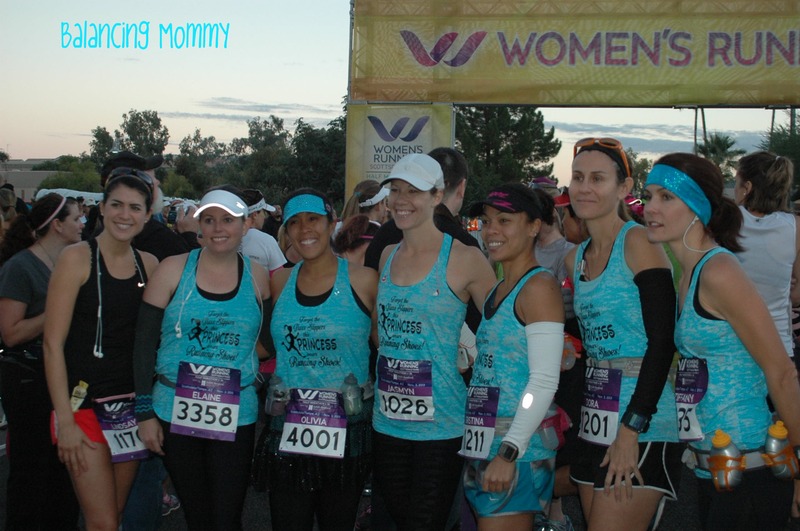 I ran the Women’s Racing Series Women’s Half Marathon in 2010, so I was familiar with the race and the course. The race expo was great. It’s a smaller so you can go through pretty quickly. The expo staff was amazing! My shirt was a little too small, but they let me exchange it right on the spot. As I mentioned in a previous post, I was more focused on celebrating my training and I was trying really hard not to chase the numbers! I’m so motivated by numbers though, so that’s a hard task itself. 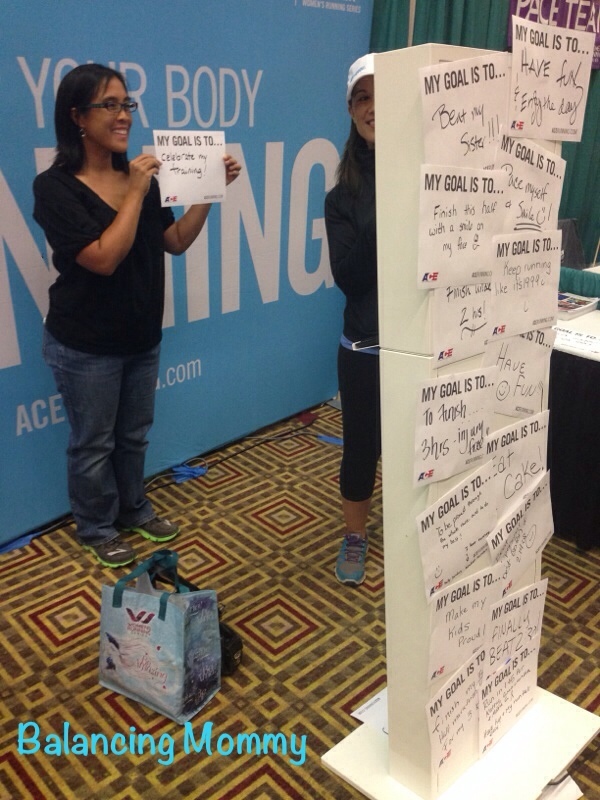 I made the celebration a goal at the Ace Running booth. 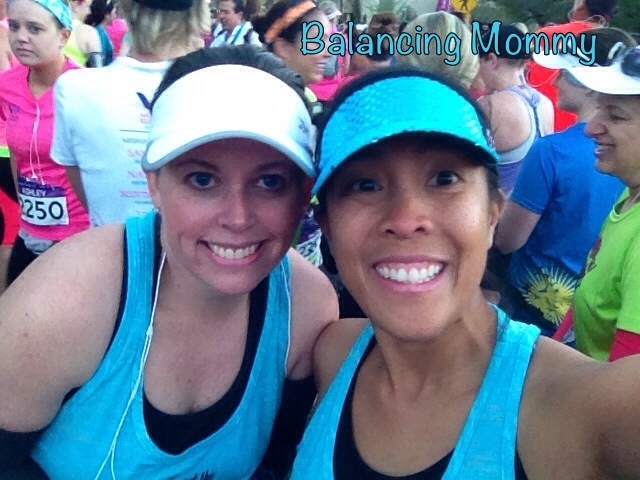 I carpooled with a bunch of the gals I run with on Sundays from Cadence. We got up early, met at 5:15am and headed to the shuttles. It was a little chilly when we got to the start in Scottsdale. I had some thigh high socks which I cut for arm warmers. I was afraid of chafing, so I left them in my bag check. The weather was warming up so I wasn’t going to need them. We had plenty of time to use the potties (multiple times! ), get warmed up and pose for more pictures. Some of the gals are pretty speedy, so those of us that are a little slower headed towards corral 3. They gave each corral a couple of minutes in between, so we got to countdown a few times before it was our turn. We were close to the 2:30 pacer, and I tried my hardest to keep up with them when we started, but I just couldn’t. Everyone was so excited, and that meant the pace was too fast right out of the gate. I started feeling my chest tighten up, so I glanced down at my garmin and saw that we were going way too fast (around 9:30), so I held back and maintained a pace that was good for me. 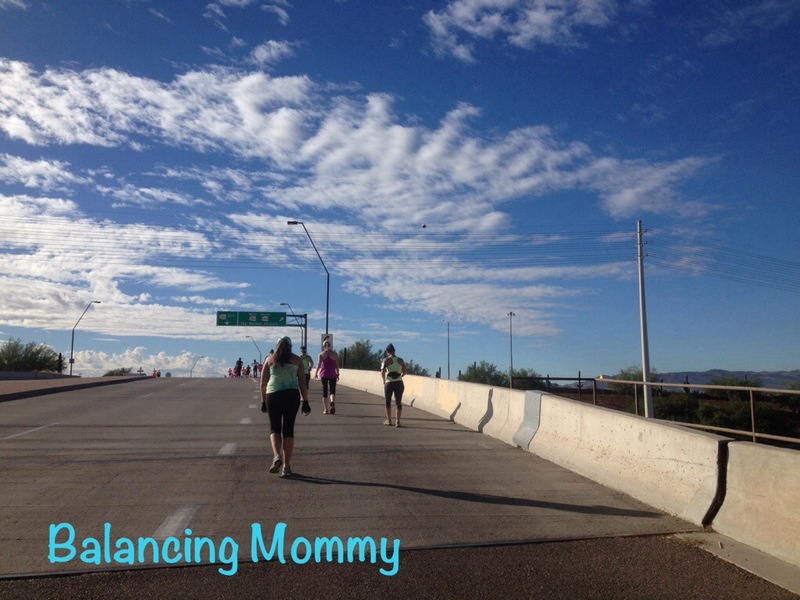 “My pace, my peace” was my mantra as we were going through downtown Scottsdale. As long as I was just under a 12 minute pace, I knew I was going to be okay. I was getting passed pretty steadily, but I kept reminding myself that we still had a long way to go and I had to keep my kicks for later. During the run, one thing that really struck me were the amount of cheerleaders on the course. 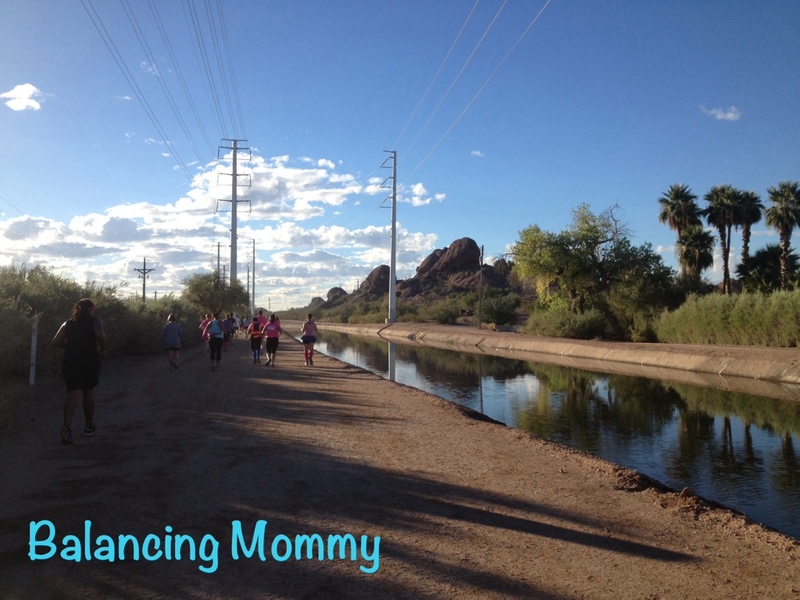 I was really impressed with the AZ Track N Trail running group. They had posters and cow bells and were really motivating. A few of the guys were on bikes, so they would bike ahead and be at certain parts along the course. I’ve been lurking in their facebook group, and my schedule just hasn’t matched up for me to meet up with them. It was really awesome to see them out in numbers. We ran along the canal for a mile and a half and then came back to the road. The canal section proved to be pretty tough; It was hard trying to pass (and be passed by) people due to the varying degrees ground firmness. I think that I had a little pebble in my shoe. Thankfully it wasn’t enough to be bothersome. After the canal section, we went down hill for a little bit before coming up to another big hill along Curry Road. I remember shouting out something to the effect of “Whoo-hoo!” once I reached the top. A few of the runners around me either laughed or grunted in agreement. I remember feeling both excited and grumpy once we reached the Mill Ave bridge. No more jumping for the photographers. 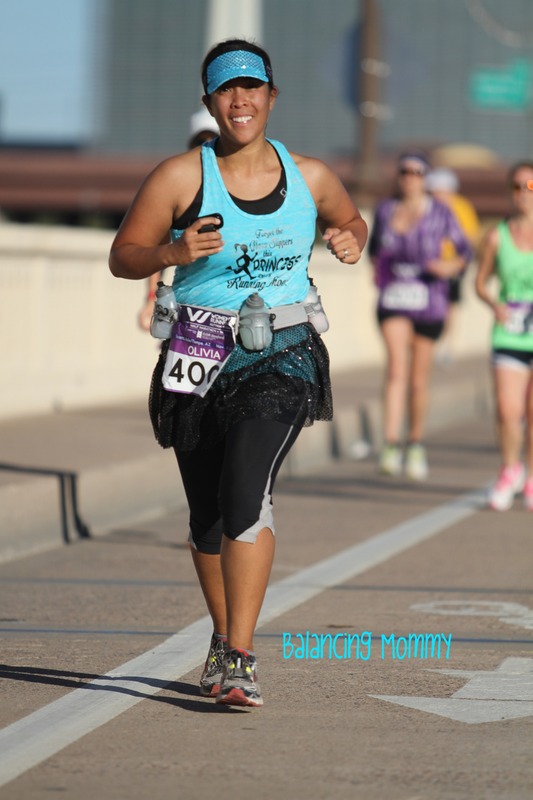 I was on the bridge as the first finishers started coming in, so I was excited for them but a little frustrated that I still had halfway to go. 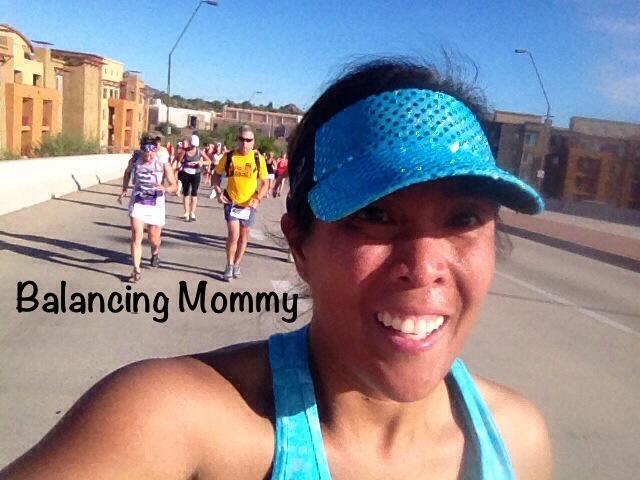 Once we turned onto Rio Salado, it was great to see all the runners coming in to the finish. I was able to cheer on most of the gals I knew, and it was really awesome to see them finishing strong. It gave me hope, even though I knew I had another hour to 45 min on the road. Around mile 9 (and 12), the LUNA bar aid station had a DJ playing some awesome music with great beats. 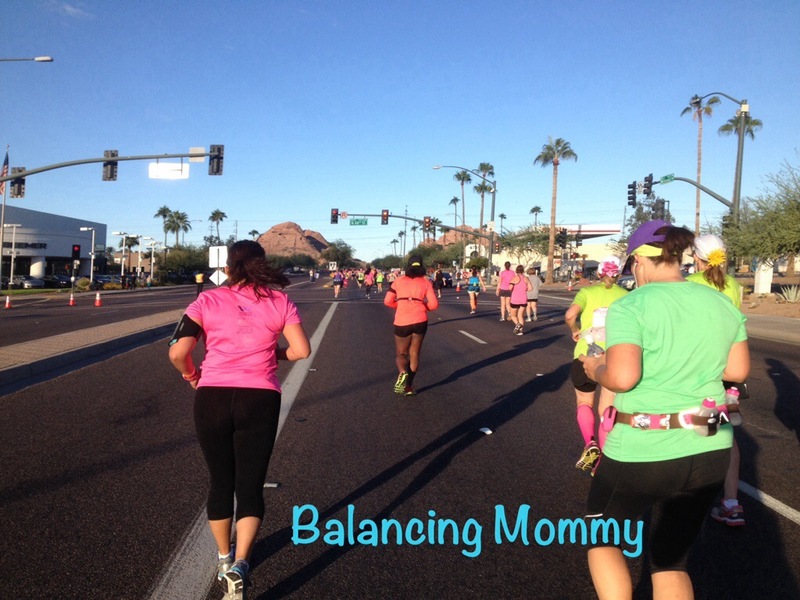 It was the motivation I needed to help me pick up my pace and get cadence set. There was a scary sight on the course around mile 10, an ambulance had to come an rescue a fellow runner. I hope that she is doing alright. Once we passed the aid station around mile 10, I tried to tell myself that I only had a 5k to finish. I made a mini pact to run the rest of the way. I had slowed down at a couple of spots earlier in the course (mainly the hills) and I was trying to get back time. I totally forgot about the Center Parkway overpass. Center Parkway overpass — goes straight up! 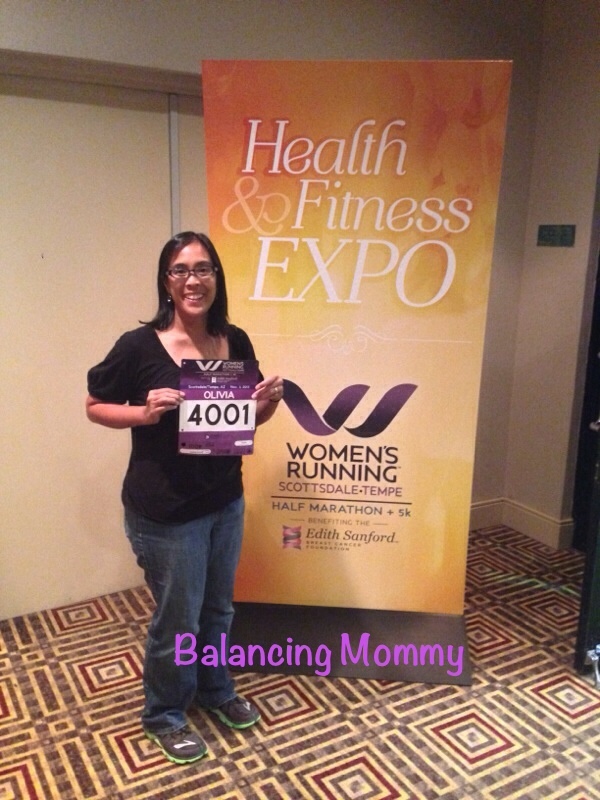 I allowed myself to walk for a minute and then I pushed myself to keep running. Once we got back on to Priest Drive, I was trying to get myself psyched to run the rest of the way. 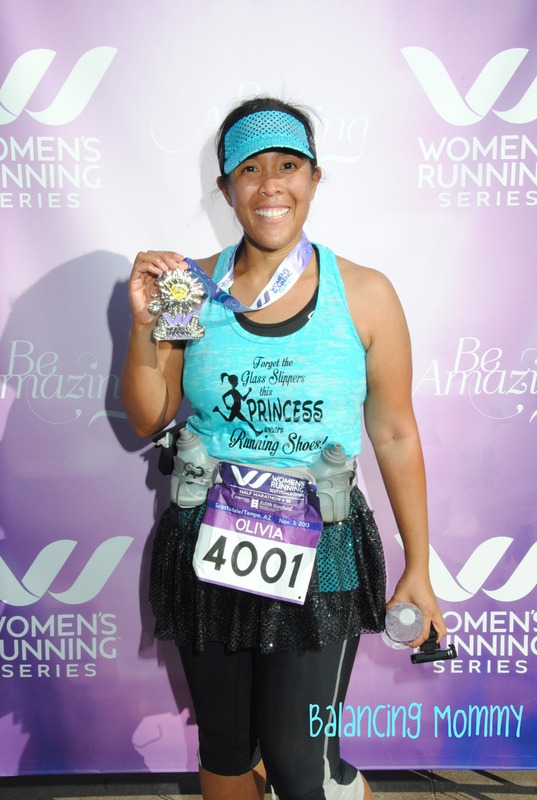 I gained some momentum passing fellow runners and the music from the LUNA station at mile 12 was great motivation and kept me going for a little bit, but that last mile was the hardest! Right around Tempe Center for the Arts, my mind and my body fought and I gave in… I just had to walk. I spotted the 2:30 pacer and I saw her walking. I knew that she started out a little to quickly. This was a little more of the fire I needed to get to the finish line. There was a chance that I could make the 2:30 mark! 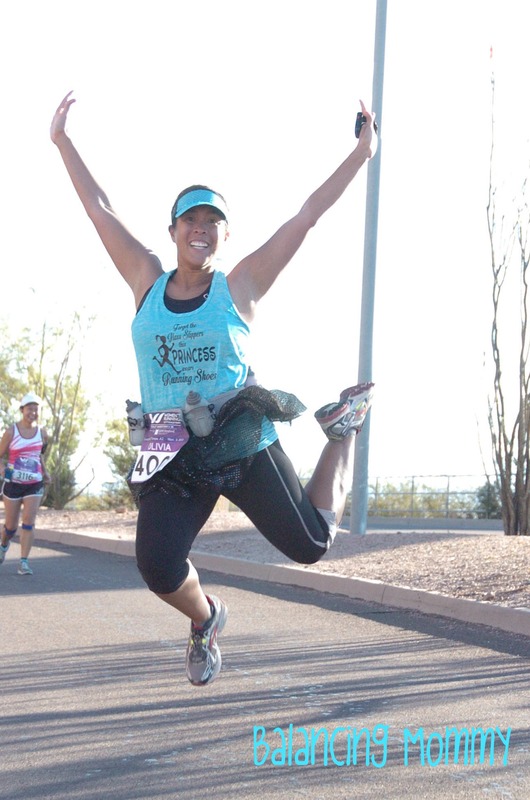 Once I turned the corner to Rio Salado and saw the crowd close to the finish, I started singing “Black Horse and the Cherry Tree” to push/propel myself toward the finish line. Yes, I was singing the “Whoo-hoos.” Yes, I was singing them aloud. Singing may not be the correct word, I think that I was just yelling “Whoo-hoo” to myself. I had to yell “Watch your step” to myself since I had to jump the curb to turn into Tempe Beach Park. I fought and pushed myself to have a strong finish and did a little jump right at the line. I was so happy to see that I made it right at 2:30! 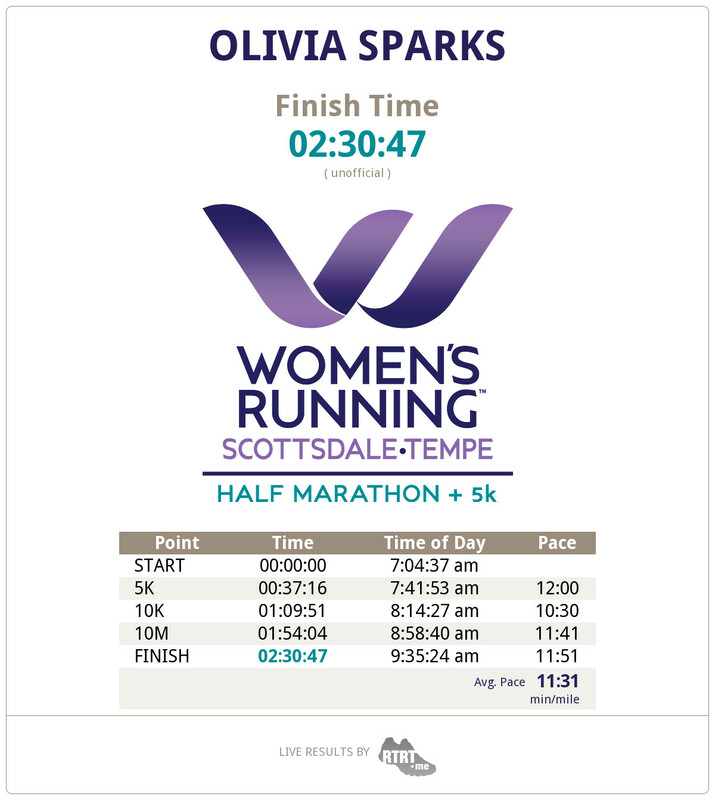 My official time was 2:30:45! It was definitely a celebration of my training! It was truly a wonderful day. The weather was perfect. 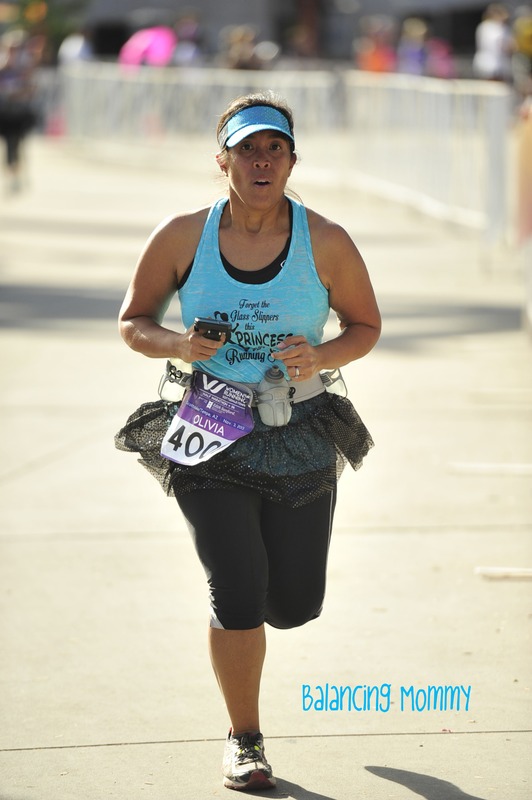 While I wish that I was just a tad bit faster, I knew that I gave it my best that day. 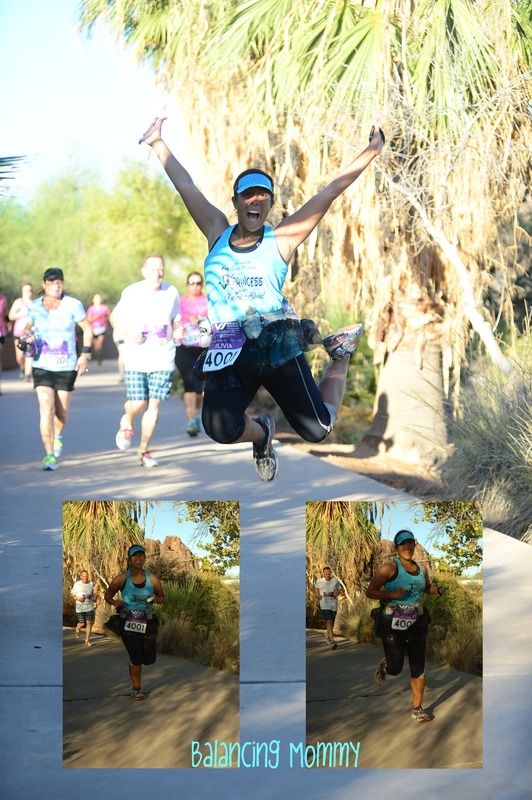 I had a great time running and that’s what matters the most! 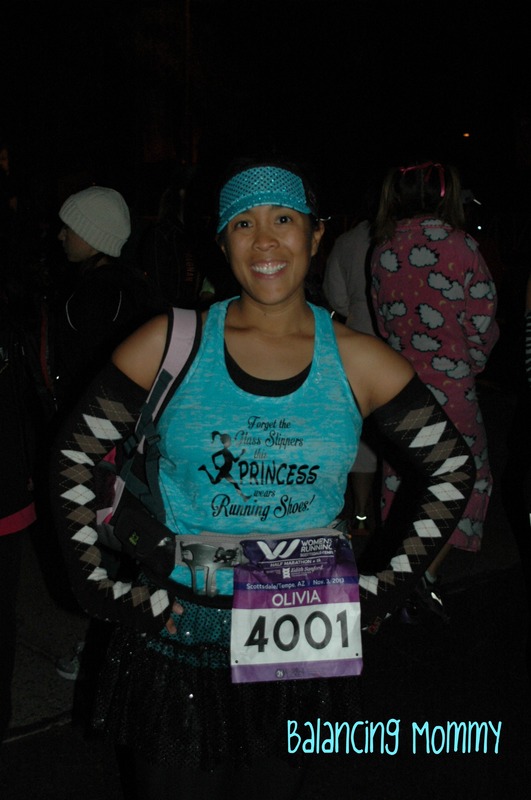 Posted in Exercise, RacesTagged Half marathon, race, recap, running, WRS Race SeriesBookmark the permalink.